Herring Gull AD9.T 2cy (argenteus), August 12 2010, Westkapelle, the Netherlands. Also as 2cy. Herring Gull (argenteus) CSAP 3CY, March - August 2010, Koksijde, Belgium. Picture: Peter Adriaens. Herring Gull L-910675 3cy (argenteus), August 27 2011, Boulogne/Mer, France. Picture: J-M Sauvage. Herring Gull H-127132 3cy, August 12 2004, Westkapelle, the Netherlands (51.33N, 03.25E). Herring Gull (argenteus) BLB H-162941 3CY, August 12 & September 01 2010, Westkapelle, the Netherlands. Herring Gull (argenteus) H-162942 3CY, August 19 2010, Westkapelle, the Netherlands. Herring Gull (argenteus) 0U 3cy, August 12 2010, Westkapelle, the Netherlands. Herring Gull argenteus 9U 3CY, August 12 2010, Westkapelle, the Netherlands. Herring Gull (argenteus) W0 3cy, August 12 2010, Westkapelle, the Netherlands. Herring Gull (argenteus) X.Y 3CY, August 16-20 2015, Maasvlakte, the Netherlands. Picture: Leo Snellink. Herring Gull (argenteus) 5.352.670 3cy, August 28 2003, IJmuiden, the Netherlands (52.27N, 04.33E). Herring Gull (argenteus) NLA 5.425.417 3CY, August 25 2011, IJmuiden, the Netherlands. Herring Gull (argenteus) 5.463.321 2cy-3cy, August 29 2012, IJmuiden, the Netherlands. Herring Gull (argenteus) NLA 6169494 3CY, August 30 2013, Warmond, the Netherlands. 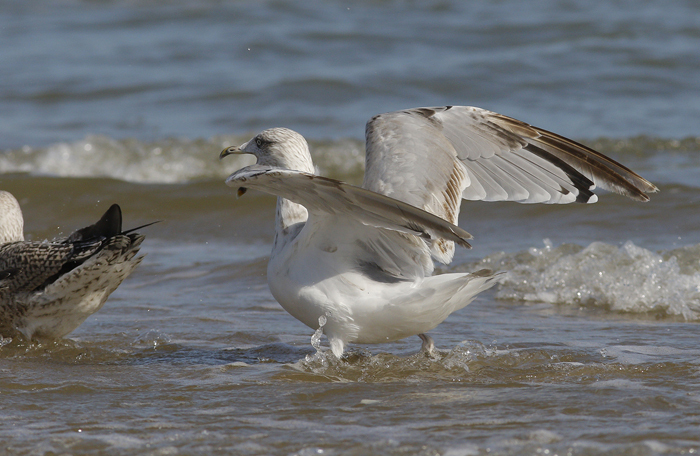 Herring Gull argentatus AZ56 3CY, Augustus 2014, Scheveningen Haven, the Netherlands. Picture: Merijn Loeve. Herring Gull 81...39 3cy (argentatus), August 08 & 12 2002, Tampere, Finland (61.31N, 23.43E). Herring Gull J0434 3cy (argentatus), August 25 2010, Barneveld, the Netherlands. Herring Gull C525K 3cy (argentatus), August 11 2002, Tampere, Finland (61.31N, 23.43E). Herring Gull C67K0 3cy (argentatus), August 11 2002, Tampere, Finland (61.31N, 23.43E). Herring Gull C5J54 3cy (argentatus), August 12 2002, Tampere, Finland (61.31N, 23.43E). Herring Gull KN79 3cy (argentatus), August 12 2006, IJmuiden, the Netherlands (52.27N, 04.33E). Herring Gull 3cy (argenteus), August 20 2012, Katwijk, the Netherlands. Herring Gull 3cy (argenteus), August 22 2012, Katwijk, the Netherlands. Herring Gull 3cy (argenteus) 3cy,August 21 2012, Noordwijk, the Netherlands. P7/-. Herring Gull sub-adult (argenteus) 3cy,August 21 2012, Noordwijk, the Netherlands. 3cy or 4cy. Herring Gull 3cy (argenteus), August 29 2012, IJmuiden, the Netherlands. Herring Gull 3cy (argenteus), August 11 2003, Boulogne/Mer, France (50.42N, 1.34E).